"Merry Christmas!" We're now saying it for the first time in a long time without concern for verbal reprisal by hateful, bigoted fanatics, emboldened by government thought police. But, I digress. 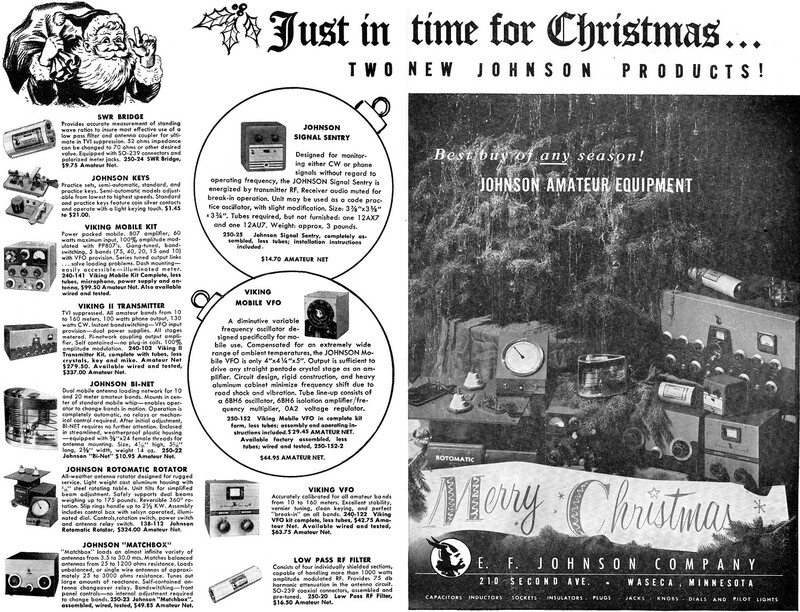 Here is a 2-page advertisement run by the E.F. Johnson company in the December 1953 issue of the ARRL's QST magazine. 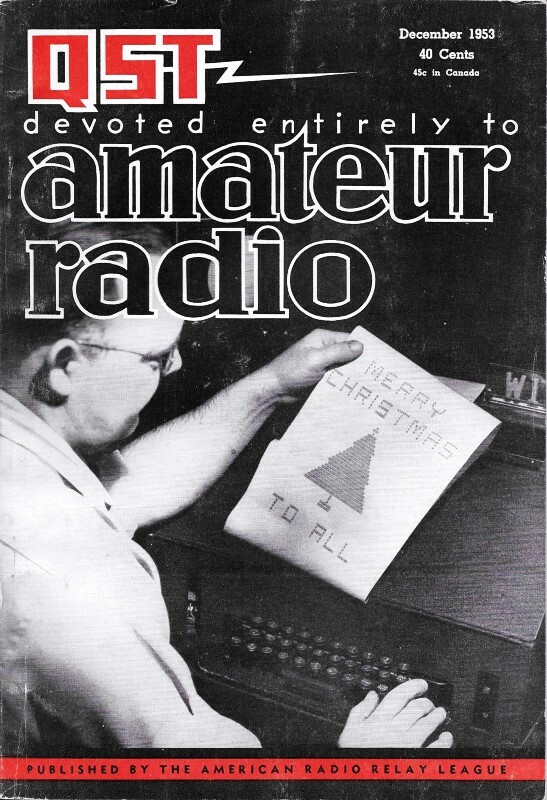 E.F. Johnson was a major player in amateur radio, and then later Citizens Band (CB) radio. They also manufactured a large array of point-to-point commercial radio products (Land Mobile Radio Service, LMRS, and Commercial Mobile Radio Service, CMRS), as well a large line of RF connectors and adapters. 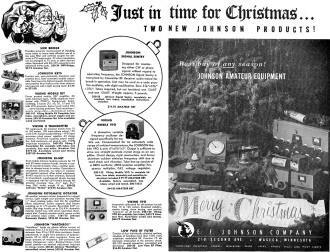 The wireless automatic meter reading (AMR) industry was pretty much born out of a very capable group of engineers, technicians, assembly workers, and managers at E.F. Johnson's facility in Waseca, Minnesota. They occupied a portion of the very large building where E.F. Johnson manufactured its many products (back when Americans actually built electronics equipment). The break-off company was originally named Enscan, and was later bought by Itron. Sensus is another major AMR product maker. Provides accurate measurement of standing wove ratios to insure most effective use of a low pass filter and antenna coupler for ultimate in TVI suppression. 52 ohms impedance can be changed to 70 ohms or other desired value. Equipped with SO-239 connectors and polarized meter jacks. 250-24 SWR Bridge, $9.75 Amateur Net. Practice sets, semi-automatic, standard, and practice keys. Semi-automatic models adjustable from lowest to highest speeds. Standard and practice keys feature coin silver contacts and operate with a light keying touch. $1.45 to $21.00. Power pocked mobile. 807 amplifier, 60 watts maximum input, 100% amplitude modulated with PP807's. Gang-tuned, bandswitching, 5 bands (75, 40, 20, 15 and 10) with VFO provision. Series tuned output links ... solve loading problems. Dash mounting - easily accessible - illuminated meter. 240-141 Viking Mobile Kit Complete, less tubes, microphone, power supply and antenna, $99.50 Amateur Net. Also available wired and tested. TVI suppressed. All amateur bands from 10 to 160 meters. 100 watts phone output, 130 watts CW. Instant bandswitching - VFO input provision - dual power supplies. All stages metered. Pi-network coupling output amplifier. Self contained - no plug-in coils. 100% amplitude modulation. 240-102 Viking II Transmitter Kit, complete with tubes, less crystals, key and mike. Amateur Net $279.50. Available wired and tested, $337.00 Amateur Net. Dual mobile antenna loading network for 10 and 20 meter amateur bands. Mounts in center of standard mobile whip - enables operator to change bands in motion. Operation is completely automatic, no relays or mechanical control required. After initial adjustment, Bi-Net requires no further attention. Enclosed in streamlined, weatherproof plastic housing - equipped with 3/8"x 24 female threads for antenna mounting. Size, 4 7/16" high, 5 5/16" long, 2 3/8" width, weight 14 oz. 250-22 Johnson "Bi-Net" $10.95 Amateur Net. All-weather antenna rotator designed for rugged service. Light weight cast aluminum housing with 5/16" steel rotating table. Unit tilts for simplified beam adjustment. Safely supports dual beams weighing up to 175 pounds. Reversible 360° rotation. Slip rings handle up to 2 1/2 KW. Assembly includes control box with selsyn operated, illuminated dial. Controls, rotation switch, power switch and antenna relay switch. 138-112 Johnson Rotomatic Rotator, $324.00 Amateur Net. "Matchbox" loads an almost infinite variety of antennas from 3.5 to 30.0 mcs. Matches balanced antennas from 25 to 1200 ohms resistance. Loads unbalanced, or single wire antennas of approximately 25 to 3000 ohms resistance. Tunes out large amounts of reactance. Self-contained antenna changeover relay. Bandswitching - front panel controls - no internal adjustment required to change bonds. 250-23 Johnson "Matchbox", assembled, wired, tested, $49.85 Amateur Net. Designed for monitoring either CW or phone signals without regard to operating frequency, the Johnson Signal Sentry is energized by transmitter RF. Receiver audio muted for break-in operation. Unit may be used as a code practice oscillator, with slight modification. Size: 3 /8"x3 5/8" x 3 3/4". Tubes required, but not furnished: one 12AX7 and One 12AU7. Weight: approx. 3 pounds. 250-25 Johnson Signal Sentry, completely assembled, less tubes; installation instructions included. A diminutive variable frequency oscillator designed specifically for mobile use. Compensated for an extremely wide range of ambient temperatures, the Johnson Mobile VFO is only 4"x 4 1/4"x 5". Output is sufficient to drive any straight pentode crystal stage as an amplifier. Circuit design, rigid construction, and heavy aluminum cabinet minimize frequency shift due to road shock and vibration. Tube line-up consists of a 6BH6 oscillator, 6BH6 isolation amplifier frequency multiplier, 0A2 voltage regulator. 250-152 Viking Mobile VFO in complete kit form, less tubes; assembly and operating instructions included: $29.45 Amateur Net. Accurately calibrated for all amateur bands from 10 to 160 meters. Excellent stability, vernier tuning, clean keying, and perfect "break-in" on all bands. 240-122 Viking VFO kit complete, less tube. ; $42.75 Amateur Net. Available wired and tested, $63.75 Amateur Net. Consists of four individually shielded sections, capable of handling more than 1000 Watts amplitude modulated. RF. Provides 75 db harmonic attenuation in the antenna circuit, 50-239 coaxial connectors, assembled and pre-tuned. 250-20 Low Pass RF Filter, $16.50 Amateur Net. Best buy of any season!